For those who are not familiar with Dr. Roy Spencer, he describes himself as a "climatologist, author, former NASA scientist." His blog is cool, discussing from "Global Warming: Natural or Manmade? ", "Global Warming 101", "Research Articles and Simple Climate Model", among others. His belief about climate change -- "it happens, with or without our help." Cool guy. Dr. Spencer is associated with the Univ. of Alabama in Huntsville (UAH) and this university's climatologists interpret various temperature data collated by NASA's Aqua (and other?) satellites on 24/7 basis -- sea surface temp. (SST), temperature of the lower troposphere (TLT), others. And here's the latest TLT anomaly for October 2010, it has gone down to only 0.42 C. Click on the graph to get a bigger image. I was very lucky to meet him in person last May. 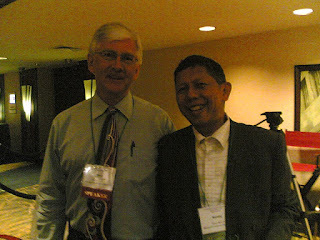 At the Heartland Institute's 4th International Conference on Climate Change (4th ICCC) in Chicago, he was one of the plenary speakers. During cocktails, I met him and immediately asked for a picture with him. ...there was a strong push for policy changes that even most of the scientists involved supported — ultimately culminating in the governmental control over how much and the kinds of energy sources humanity would be allowed to use in the future. The belief that a better-educated few should be allowed power over the less educated masses. That government knows better than the people do. There is a big political and environmental lobby to demonize if not kill certain energy sources that are cheap but are deemed "dirty and cause man-made warming", and then use huge taxpayers' money to subsidize "clean and no carbon emission" power sources. I have argued before that personally, I have nothing against wind farms, solar farms, other renewable energy sources. They should be allowed, like all other energy sources. Their presence expands the range of choices for people over what kind of energy sources they wish to give them electricity and power in their homes, offices, communities and cars. What I am against is government coercion of tax-tax-tax certain energy sources and turning around to give the huge tax collections to feed a big and expanding government climate bureaucracies, the government-funded environmental groups and NGOs, and the subsidy-dependent renewable power sources. Use voodoo science, quick-fix climate soundbytes, just to get the energy socialism that they wish for. If people want to use solar and wind energy sources, then they should pay for it even if these are expensive. Let them spend their money where their mouths are. They should not clamor for expensive energy sources become artificially cheap by making governments force you and me to pay for higher energy taxes. Meaning you and me and other people who do not believe in whatever energy subsidies should be forced and coerced to give such subsidy to them. And here's Dr. Spencer's take on free markets. I love his definition of it. Wow! I almost forgot that Dr. Spencer is a natural scientist, not an economist or social scientist or a businessman. I don't want to make any elaboration on those words as they are so beautifully explained. This should be the main reason why I was lucky to corner him in the picture above. Minimal government philosophy jibes 100 percent with climate realism. "Psychologically, the U.N. has contributed a great deal to the gray swamp of demoralization—of cynicism, bitterness, hopelessness, fear and nameless guilt—which is swallowing the Western world." -- Ayn Rand, “The Anatomy of Compromise,” Capitalism: The Unknown Ideal, 148. The globalists, environmentalists and global warming elitists have found a new sanctuary, which allows them to amass tremendous political power to pursue their altruist-collectivist goals: the U.N. Yes. After the collapse the Berlin Wall 21 years ago, the socialists were scampering what new "cause" they can hop in. Environmentalism and global warming were convenient issues to pursue their socialist and interventionist goals.